Bacteria in your mouth form a sticky film (plaque) on teeth and gums. If not removed, this hardens into a crust (tartar). The bacteria in plaque and tartar can cause an infection called periodontal disease. This can lead to pain, gum damage, bone loss, and even tooth loss. Scaling and root planning is a special type of cleaning done by a general dentist, dental hygienist, or periodontist. This cleaning removes plaque and tartar from beneath the gums. This helps restore health to your gums and teeth. Scaling and root planning removes plaque and tartar from below your gum line. This controls the growth of harmful bacteria. It also helps gums reattach firmly to the teeth. Because this procedure goes deeper than a regular cleaning, your mouth may be numbed. The cleaning may take 1 to 4 appointments to complete. 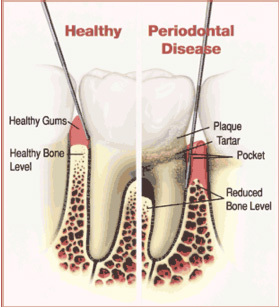 Periodontal disease can be an ongoing problem. Keep your gums and teeth healthy: brush, floss and visit your dentist for regular exams and cleanings. Call your dentist if you notice any tooth or gum problems.